The football coach that confronted the shooter should have been the one armed. 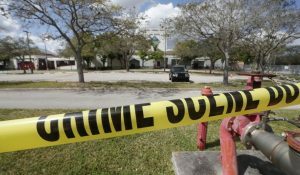 A Florida sheriff says the deputy who was on duty at a high school where 17 people were massacred waited outside the building for about four minutes without ever going in. Broward County Sheriff Scott Israel announced during a Thursday news conference that Deputy Scot Peterson resigned after being suspended without pay. Israel said he made the decision after reviewing video surveillance and interviewing witnesses, including the deputy himself. The sheriff says Peterson responded to the building where the shooting took place, took up a position outside a door and never went in. Authorities say 19-year-old Nikolas Cruz fatally shot 17 people at Marjory Stoneman Douglas High School in Parkland on Feb. 14.